The Rainbow Room is shining brightly once again, high above New York City on the 65th floor of 30 Rockefeller Plaza. Doors of the famed restaurant and dance hall reopened in early October for brunch, dinner and entertainment. After being closed several years for renovations, the legendary Rainbow Room is back with the same spirit, style and sophistication. The dazzling crystal chandelier and revolving dance floor are still the centerpieces of the room, just as they were in the 1930s and beyond. 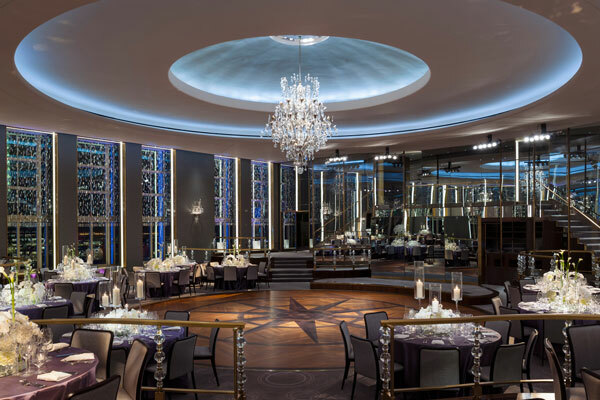 The Rainbow Room will be open to the public for most holidays, Sunday brunch, and on Monday nights for dinner and special performances in a variety of genres, including jazz, swing and more. The venue will also be available for private events on Tuesday-Saturday. During the Great Depression, on October 3, 1934, the doors of the Rainbow Room opened for the first time. It was the first restaurant in the U.S. to be located in a high-rise building and remained that way for decades. With its cosmopolitan elegance, the Rainbow Room overlooks midtown Manhattan and unveils a sparkling skyline at night. Over the years, the biggest movie stars, entertainers and other notables - from Joan Crawford, Elizabeth Taylor and Michael Jackson, to New York City mayors Fiorello LaGuardia and Michael Bloomberg, to Al Pacino, Barbra Streisand and Muhammad Ali - all dined, danced and celebrated countless occasions at the Rainbow Room. A downturn in the economy and corresponding decline in business resulted in the 2009 closure. In September 2013, building operators announced the landmark would reopen to its former status as "one of the city's most notable culinary icons." British chef Jonathan Wright was hired to helm the kitchen, which will serve Sunday brunch and Monday night dinners. Wright, who brings over 20 years of international experience to the Rainbow Room, has created a menu of classic and contemporary cuisine, including Oysters Rockefeller, Lobster Pot Pie with Black Truffles and Herb Roasted Pennsylvania Lamb. Known for his globally-inspired and interactive brunch at The Setai on Miami Beach, Wright will "transform the iconic dance floor into an expansive culinary stage." Comprised of several stations each run by a chef with a cuisine specialty, the brunch experience will take diners on a bite-by-bite journey around the world. Dedicated chef's tables will feature a spectacular raw bar, house-made breads, a roasted meat station offering dishes like Herb Roasted Amish Chicken and an array of Asian specialties, including Char Siew Barbeque Pork Steamed Buns and Thai Chicken Green Curry. An assortment of breakfast pastries, cheeses, charcuterie and smoked fish will also be available. A child-friendly, kid-height brunch buffet will delight those under the age of 12. Next to Rainbow Room sits SixtyFive, a new cocktail lounge that will be serving classic and contemporary cocktails, such as the 1915 Gin & Tonic made with Dorothy Parker Gin, Lemon, Angostura biters and Johnnie Ryan Tonic. A previously vacant outdoor terrace on the 65th floor has been appropriated for outdoor seating. © 2019 City Pass, Inc. 保留所有权利.